AmazonCEOJeff Bezos likes to talk about his business, but he is often stingy with the details. This is not the first time the CEO has talked about Marketplace, Prime, and AWS, but it is the most in-depth discussion he has ever offered. While Amazon Marketplace -- the offers to purchase items from third-party sellers that appear alongside company listings -- are now well-integrated into the site, Bezos reminded shareholders that was not always the case. He took readers through the evolution of the division which started as an auction site and joked that "seven people came, if you count my parents and siblings." Despite those early struggles, the Marketplace (under a number of different names) went fromaccounting for "5% of units" sold in its first year to now where Bezos wrote, "more than 40% of our units are sold by more than two million third-party sellers worldwide. Customers ordered more than two billion units from sellers in 2014." Amazon, the CEO explained, has been able to leverage that model across the globe, and success in one country leads to success in another. "Almost one-fifth of our overall third-party sales now occur outside the sellers&apos; home countries, and our merchants&apos; cross-border sales nearly doubled last year," he wrote. Bezos explained that Prime has always been a bit of a gamble for the company. In the early days, the company "gave up many millions of dollars in shipping revenue, and there was no simple math to show that it would be worth it." Despite that, he believed strongly in the concept and felt that customers would ultimately understand the deal they were getting and sign up, giving the company the scale required to lower the cost of shipping. Well, those early investments paid off and allowed the company to create"large-scale systems to automate much of inventory replenishment, inventory placement, and product pricing." That has led its shipping operation to expand from 13fulfillment centers in 2005, when Prime launched, to 109 this year. 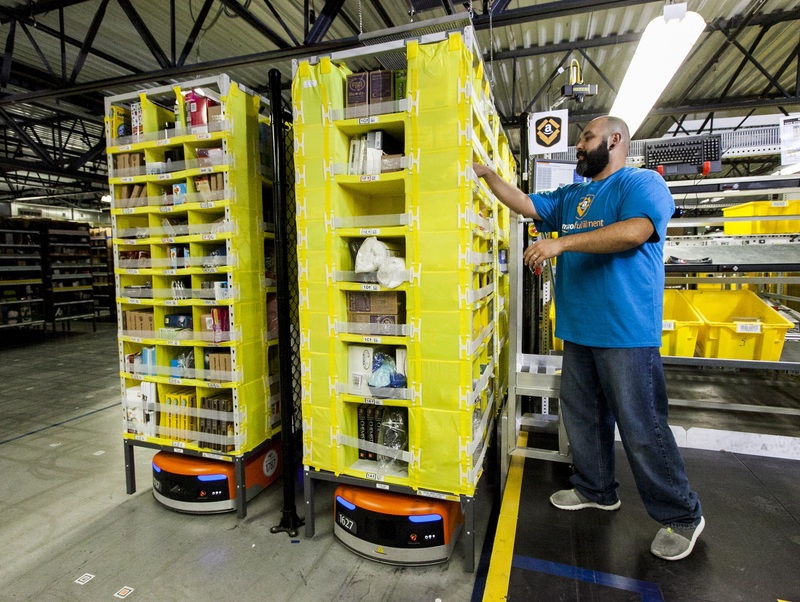 The centers themselves have improved and now include "more than 15,000 robots to support the stowing and retrieval of products at a higher density and lower cost than ever before." Bezos explained that the expansion into video and other areas may also not seem like obvious money makers, but company tracking shows that they are. "We watch Prime free trial starts, conversion to paid membership, renewal rates, and product purchase rates by members entering through this channel," he explained. "We like what we see so far and plan to keep investing here." This quarter marked the first time Amazon broke out revenue for its cloud services business, and in line with that, Bezos added his thoughts. When AWS was launched, he explained, the goal was to offer "on-demand, pay-as-you-go cloud storage and compute resources dramatically increased the speed of starting a new business." In the early days, he wrote, start-ups were the first adopters, but that has changed. "Large enterprises have been coming on board as well, and they&apos;re choosing to use AWS for the same primary reason the start-ups did: speed and agility," he wrote. "Having lower IT cost is attractive, and sometimes the absolute cost savings can be enormous." Bezos does not believe cost savings alone would "overcome deficiencies in performance or functionality." Instead, AWS has succeeded because it offers a "better and faster" solution. "Enterprises are dependent on IT -- it&apos;s mission critical. So, the proposition, &apos;I can save you a significant amount on your annual IT bill and my service is almost as good as what you have now,&apos; won&apos;t get too many customers," he wrote. "[T]he cost savings is the gravy, not the steak." The CEO offered additional color noting that AWShas more than a million active customers as companies and usage grew by approximately 90% in the fourth quarter of 2014 versus the prior year. He also said that the division was still in its beginning stages. "We&apos;ve increased our pace of innovation as we&apos;ve gone along -- from nearly 160 new features and services in 2012, to 280 in 2013, and 516 last year," he wrote. The article 3 Things Amazon.com, Inc. CEO Jeff Bezos Wants Investors to Know originally appeared on Fool.com. Daniel Kline owns shares of Apple. He buys something from Amazon nearly every day and is a Prime member. The Motley Fool recommends Amazon.com and Apple. The Motley Fool owns shares of Amazon.com and Apple. Try any of our Foolish newsletter services free for 30 days. We Fools may not all hold the same opinions, but we all believe that considering a diverse range of insights makes us better investors. The Motley Fool has a disclosure policy.